First off, there is no edging on this sad little scarf square. I don't care if the world thinks I'm wrong, but at this point in my knitting life, I am a firm believer in the power of edgings- they just make things look so much cleaner, handmade and less "crafty". Have I mentioned my dislike for the term "crafty"? It conjures up images of pipe cleaners and glue guns, which just aren't the same, to me. Secondly, I live in Houston, Texas, where What the Heck Am I Going To Do With This Giant Scarf? I already have a giant scarf that is currently vacationing in the outlands of Jacki's Closet, so why am I bothering with this?! So obviously, I'll be tearing this little beauty out, in favor of something else. 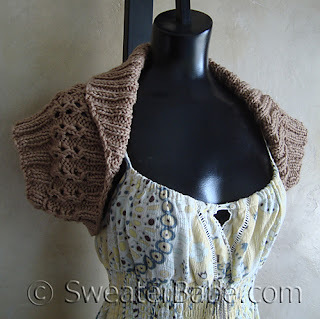 Maybe a bulky shrug that I can wear during the two weeks of spring that we have? And finally, the adorable Bazan by the adorable Jane Richmond. I swear, Jane Richmond could macrame a g-string and I'd queue it. 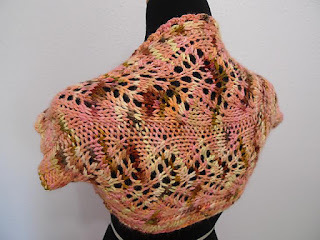 I think that if you do a shrug then it needs to be pretty plain to show off the yarn and also the yarn will overpower any pattern. It would make a lovely lined bag with wooden circular handles but I'd be concerned about pilling. The same thing would apply to something like a cushion cover. Hmmm, it's a tough one. 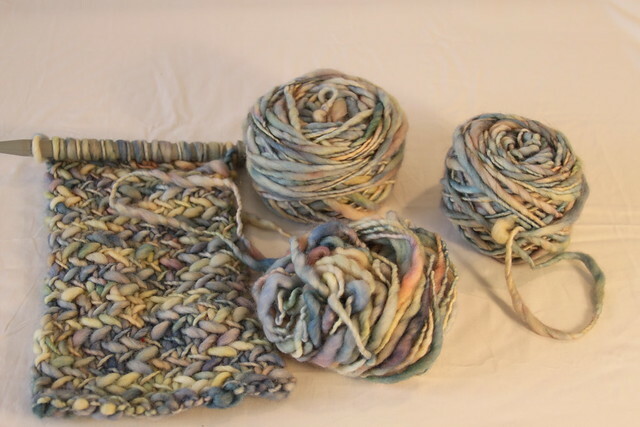 It's gorgeous yarn, but I can see your dilemma! I was going to suggest switching the herringbone scarf for "my so called scarf" - even without an edge I think it looks fab. But if you don't want a scarf then I'm stuck! A shrug would be cute, although less patterning would be good for the yarn. Not sure if you're a capelet kind of person? Maybe that could work?